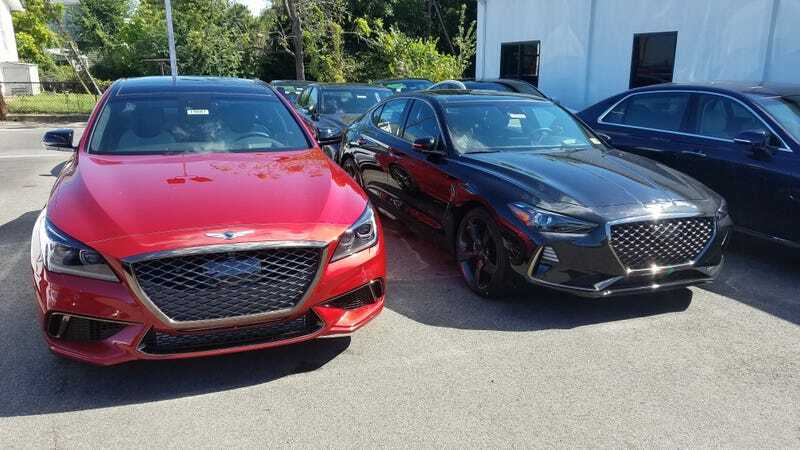 I noticed that Alexandria Hyundai had quite a few Genesis G70s around so I figured I’d take a couple of minutes and give a few cars the old Scandinavian Frisk. For me, the G70 felt like its own thing and harmonized well with the larger Genesis sedans. Im still not getting a sense of brand identity, just brand values. If you’re looking for passionate then be warned that you will receive thoughtfulness instead. The G70 comes across as an easy sell, not requiring any research prior to shopping because everything is intuitive to the point of being evident at a glance. No obvious hidden features or secrets, and if there are any, you don’t need to unlock them in order enjoy the car. Materials are what you expect. Build is what you expect. The car is what you expect! Everything is satisfying as a whole but this car only shifts gears not paradigms. But yeah, the G70 is filled with content you can be content with! This is yet another Genesis that does great quality nonchantly. It feels like what you’re supposed to be getting for your money, but nothing about the car ellicts an emotional attachment nor buyer’s remorse (initially, anyways). The most critical win that the G70 delivers is the realization that the G80 is a better car than it. In fact, now that the G70 is a well-built premium car at the bottom of the Genesis lineup, the G80 appears as an authentic luxury car without apologies. We really undervalued the DH generation of the Genesis Sedan. I think that the G70 will leave owners extremely satisfied and yeild an outstandingly high customer loyalty percentage when people decide to trade-up. I point this out because competitors such as the IS or Q50 dont make you crave a GS or Q70. Instead, they make you want a car in the same class but nicer which requires a performance specification, an all new generation of the model series, or leaving the brand. To anyone studying product planning or brand building, I will say that Genesis is nailing it at the product level but should admit that Genesis as a standalone luxury brand in the US is a complete loss. The buying experience feels like a Hyundai subbrand, looks like a subbrand, sounds like a subbrand, and tastes like microwaved toothpaste from extract instead of concentrate. The product does a sweet job but the system inherently produces sour delivery.